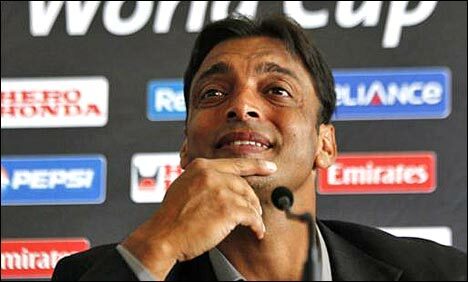 Fast bowler, Shoaib Akhtar has termed playing of either cricket teams of Pakistan and India in each other’s country as an imprudent decision. Talking to media on the occasion of tour of Mobilink Jazz Cricket Talent Hunt on Thursday, he regretted the way Pakistan was globally begging for cricket matches on its home grounds. Replying to a question, he welcomed the notion of Indian team playing home cricket in Pakistan, but was concerned about the law and order situation in Pakistan, which could result in imposition of further restrictions on Pakistani cricket, even if a single shot was fired at the Indian, or other visiting cricket team. “The captains of both Pakistani and Indian teams would be under great pressure, and only the captain with a cool patient nature would be able to make his team win”, he opined. He also informed the media that he had taken back his retirement decision during 2005, but that was not due to tour of British team. “I am a stable, consistence natured person, and have/ had never wanted to reverse his decision to retire”, he declared, while also rejecting the notion that he had any plans to get involved in politics, or had any special affiliation with any political party. He cited the availability of great cricket players like Shahid Afridi, Muhammad Hafiz, Saeed Ajmal, and Abdul Rehman for T-20 matches, and expressed his surety that if the green shirts (Pakistani team) played a prudent game, there was no better chance for winning the world cup. He said that 70-year-old (‘redundant’ aged) heads of PCB heads were unable to hold any PPL (Pakistani Premier League) matches in Pakistan, and even if they wanted to hold one PPL successfully, they would still have to be assisted by a foreign expert. The bowler, fondly titled as “Rawalpindi Express’ over his bowling speed, has also appealed to PCB to help salvage the talent of fast paced bowlers of Pakistani cricket team, while he would also tour the nook and corner of country to introduce fresh 50-60 fast paced bowlers for the cricket team. He paid tributes to good bowling of Junaid Khan, but still the team required the services of striker bowler, and also said that National Cricket Academy (NCA) should be used on commercial basis, because NCA had otherwise failed to deliver, with its officials enjoying free perks. He also stressed on financing first class cricket, lest the cricketers should go corrupted with the lust for illegal money by match fixings, and also wanted to allow another chance for the convicted Muhammad Amir to reform himself, since the penalty of match fixing was/should be not equivalent to that of murder. When is the talent hunt going to be in Rawalpindi? ?